Research shows high IQ leads to higher incomes, while countries that don't get the most from their brightest face big economic costs. The notion of "gifted" children is a hotly debated one. For every story of a 10-year-old going to Oxford there’s another about the grave effects of being isolated from your peers – not to mention the impact on self-esteem of those deemed merely “normal”. However, new research shows that the biggest question is not whether being a little genius makes you happy – but how to identify gifted children in the first place. From an academic point of view, singling out gifted children makes sense. 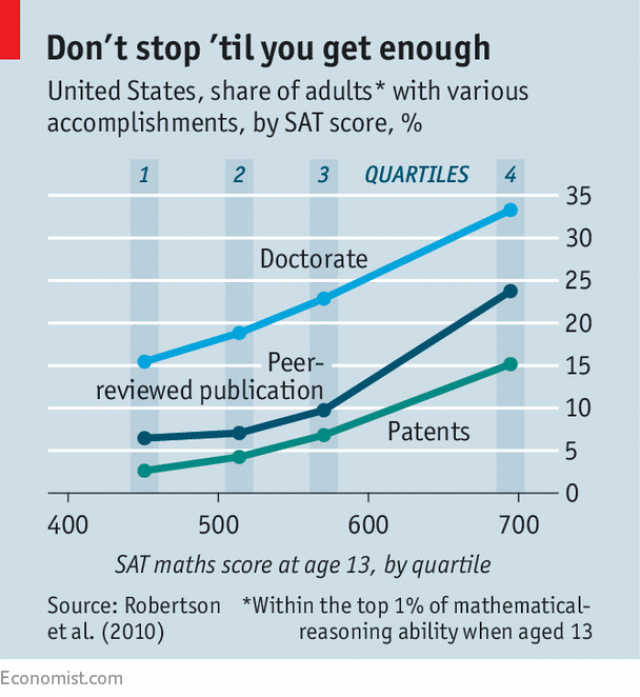 Figures from the Study of Mathematically Precocious Youth – a US programme that recruited 5,000 children over 25 years and tracked their progress through life – have revealed that early achievers tend to have a lasting advantage. Of the top 0.5% scorers in maths and verbal tests, 30% went on to bag a PhD, medical or law degree – a rate 30 times higher than standard, the Economist reports. These kids were also much more likely to have high incomes later in life, and to become entrepreneurs and innovators. Skipping a school year can help: participants in the US study who moved up a grade were 60% more likely to file patents, which are a key indicator of success. There is a widely held belief that early brilliance takes an emotional toll, and that child geniuses suffer from loneliness - cue stories of Harvard prodigies turned social recluses, or over-coached children suffering from burn-out. But researchers at the University of Edinburgh have shown that, rather than being a recipe for disaster, having an IQ that tips the scale generally means better physical and mental health as an adult. This confirms earlier findings that exceptionally able children tend to have greater life satisfaction in the long run. Early support can help these children shine. But are the right kids always singled out? In December, Stanford University researchers published a paper that mourned the “lost Einsteins” of the US education system. They discovered that the top 5% of performers in primary school tests were many times more likely to file patents in later life – but that having rich parents provided a disproportionate boost to their prospects. Some US schools are trying to bridge the gap between gifted poorer kids and their wealthy counterparts. In 2015, researchers found that when a Florida school district introduced universal screening on its tests, admissions to the gifted programme shot up 180% among poor children, 130% among Hispanics and 80% among black children – while falling for white children. In Miami-Dade, the US’s fourth-largest school district, which has a lower IQ threshold for poorer children, 6.9% of “gifted” children are black, compared with 3.6% nationwide. There's still a lot of work to do. As Lillian M Lowery of the US's Education Trust reports, "children in low-poverty schools are more than twice as likely to participate in gifted programmes as their peers in high-poverty schools" – with students of colour under-represented in both. And testing comes with its own problems, as many have pointed out. There is evidence, for example, that early test scores do not accurately reflect later success. Tests may also miss out on late bloomers, and give children the idea that their abilities are fixed at a young age. Perhaps even more importantly, IQ isn’t the only measure of success. As the Economist tells us, new research suggests that persistence and determination – or what the psychologist Angela Duckworth calls “grit” – often count for just as much as natural intelligence when it comes to success in life. Parental guidance clearly also plays a role. It is striking how many young achievers, from Mozart to Picasso to Venus and Serena Williams, were coached or at least strongly encouraged by their parents. The Economist cites the example of Singapore's gifted programme as a more traditional model that focuses on innate intelligence, as measured by tests. However, at least one participant in the programme recently wrote that his success was due to his "can-do" attitude - the idea that with sufficient focus and time, he could solve the problem in front of him. Even for the best minds of our generation, grit seems to matter.